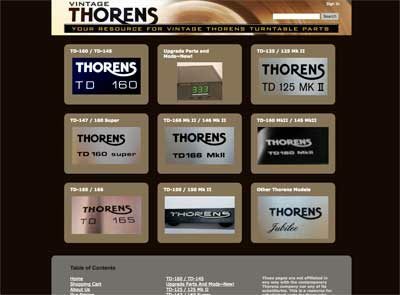 An e-commerce site selling vintage Thorens turntable parts to audiophiles and DIYers. A client based in Exeter, NH wanted to develop an e-commerce site to sell their inventory of vintage turntable parts. The site was created using a combination of the WordPress CMS for the product catalog, and PayPal for merchant services. The WordPress page hierarchy was put to use to create a catalog browse structure organized by model number. A custom shopping cart was created which interfaced with PayPal Standard Web Payments. It was important for customers to find the site, so strict SEO practices were put to use to create a site amenable to the Google search crawlers. That, in combination with some high-quality incoming links, caused the site to be ranked in the top 10 search results for ‘vintage thorens parts’ within 1 day. "The quality I most appreciate about Andy as a web designer is his ability to listen. Andy has brought two major ideas of mine to fruition, and in each case, I was amazed at how much he "got right" after just one sitting. I am also very impressed with his willingness to help the customer be self-sufficient in updating his or her website. He takes the time to "train" you, and he is amazingly patient in guiding you along, whether in person or by phone/Skype. Lastly, I LOVE punctuality ... and I could always count on Andy to attend meetings on time, return phone calls at specified times, and most importantly, deliver the project on time."